You're engaged - and it is AMAZING. You're elated, pumped out of your own gourd, your family is all walking on a dang cloud. Andddd now it's time to start planning!! Without question, the LOCATION of where to tie the knot will be your most important decision, and in my opinion, should be what you choose and lock down first. Step one folks! But what is easily the next most important thing to decide on and book?? Your PHOTOGRAPHER! 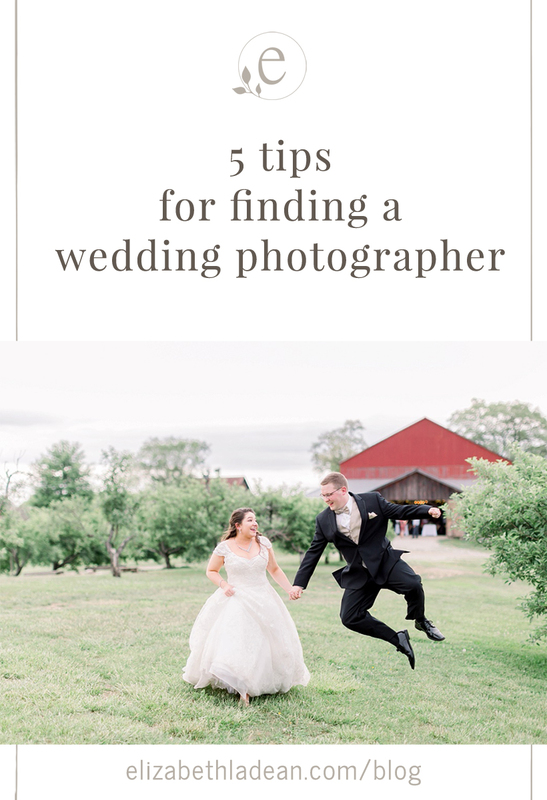 I'm going to share FIVE tips that I think are essential in the process of hiring your most ideal wedding photographer! Without question, the first thing that is going to attract you to a photographer is what their images look like - and that's how it should be. There are a whole lot of different styles out there and you should choose what you like most! Is it the bright bold colors, or the more muted colors that you like? Is it very traditional posing or completely candid in-the-moment that makes you get goosebumps? What's more appealing to you with the editing style....dark and moody, or light and airy? Ultimately, my suggestion? You want to come across wedding images of someone else and FEEL something toward them. Do you look at someone else's wedding photos and imagine yourself in that candid moment of joy, laughing with your future husband in a field of wildflowers?? If so, you're on the right track! It is vital - VITAL - that you not only meet with a potential wedding photographer prior (and if you can't do that due to location restrictions, Facetime/Skype can be your BFF's) - but that you walk away from said meeting thinking holy crapppp I love her/him, I want to be her/his best friend!! Does that sound extreme? It isn't. Think about this for a second - your wedding photographer will be the only wedding vendor you will hire who gets to spend so much time with you before your wedding. And on the big day itself, we are the only vendor who will follow you around every step for essentially the whole day! That said, you want to be able to spend your day and share your love story with a photographer who you truly, truly like as a person. If you can do that, it'll be like spending your day with your new spouse and a new best friend - totally amazing! There, I said it, but let's be real - budgets are a real thing and everybody has one. As tempting as it might be to some - when Uncle Bob or Cousin Sally who have a "very nice camera" offers to shoot your wedding day for next to nothing or nothing at all..... do yourself the biggest favor of your life and don't agree to that. Remember that after the wedding is over, the cake has long been eaten, and the flowers are starting to wilt, the only thing you will have left - besides a dress you'll likely never wear again and of course an adoring spouse - are your wedding day photos. Wedding photography can seem expensive but you won't regret the cost when you are paying for a true professional who can deliver exactly what you deserve! This brings me to my next point - Experience! The whole Uncle Bob/Cousin Sally might have made you giggle, but it's so so true! Shooting a FULL wedding day from start to finish in all different lighting scenarios, dealing with hundreds of people at once, managing inner family dynamics during group photos, knowing how to pivot and reevaulate no matter what the day brings, GENUINELY documenting your love story and SO MUCH MORE......is not, not even close to the same thing as your Uncle Bob snapping a few quick photos of you in a park one sunny afternoon. A professional photographer should have experience with all those things because all those things are just a fraction of photographing a wedding! Double experience, huh?? Let me explain. Wedding photography, and working with a wedding photographer is so much more than exchanging money for photos. It should be an EXPERIENCE, and more so, it should be a GREAT experience. A well-rounded photographer that cares will go beyond just taking and editing photos and will dedicate time to helping you with any question that pops up along the way. They will help you with the planning of your day to help the day run smoothly, most pros even create a timeline for you! They will show you time and again throughout that they care about you and your big day. The whole liking them as a person and enjoying their personality is a part of that puzzle, but things like knowing what kind of service they will provide and how they will go about all that is good info to have also. The best place to figure that stuff out, is through recommendations of others... Ask your just-married friends how working with their photographer was. Ask your venue who they highly recommend - trust me, venues have seen it all. Also, read reviews on The Knot, Wedding Wire, and Facebook - if people took the time to go and leave those reviews, they are definitely worth reading! There are of course other variables that go into choosing an ideal wedding photographer for your special day, but these are ones that I feel super strongly about! !